If you didn't know the Chanel A/W 18 show was happening last week, one click into Instagram would have guaranteed feeds flooded with visions of an enchanted forest, that classic Chanel tweed, Kaia Gerber wearing hot pink gloves and much more. Complete with every autumn necessity imaginable, including a venue doused in crisp leaves, models wrapped chin-deep in colorful scarves and knit tights that brought us right back to our childhood, this new collection had many moments we could gush over. But instead, we're pulling out the five that were most important to us—which doesn't mean we don't think you should take time to look through the 81 looks that complete this collection. After all, Chanel is the eye-candy that will make any day brighter. Last season, it was the PVC bags; this season, it's these oversized fold-over totes. It might be a little early, but we're calling it: This will be the style all the fashion girls will be carrying come fall. Which is a solid six months away, so we suggest you start saving… or preparing yourself for the ultimate accessory envy (it's never a bad time to invest in a Chanel bag). Gloves are the sleeper trend we've been eyeing all throughout fashion month, as designers have been effortlessly incorporating the accessory into collections left and right. While Karl utilised the trend in some of the more casual looks we saw come down the runway, it was the closing evening looks accompanied by over-the-elbow gloves we loved most. When I think about gloves, I think back to the periods where women would never be seen in an evening dress without their forearms delicately covered by gloves. Well, the uniform is back, and it's looking cooler than ever before. Karl Lagerfeld is known for some of the most stunning venues of all time. Because if Chanel isn't deserving of an over-the-top set, what is? 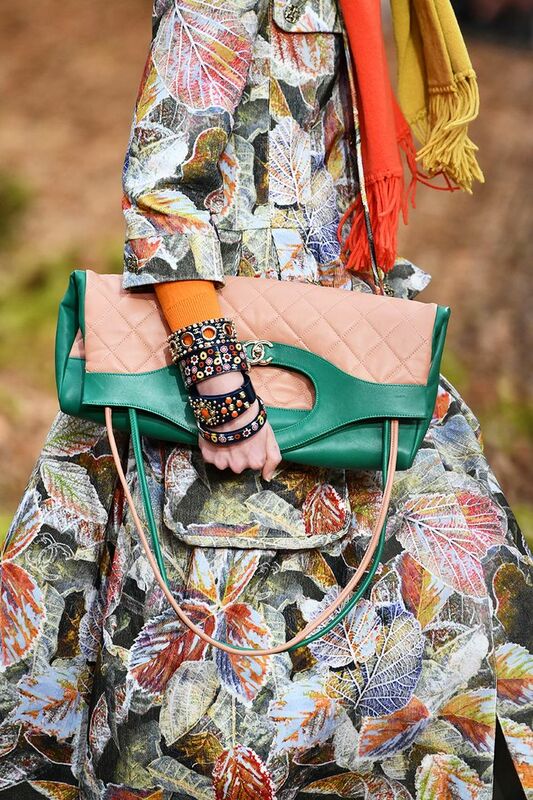 This morning, the Grand Palais in Paris opened its doors and welcomed attendees into a Chanel forest. Complete with a floor covered in crisp fall leaves, real dirt and barren trees, the mood was immediately set. Guests were prepared to be submerged in a autumn collection beyond their wildest imaginations, and that's exactly what happened next. In my opinion, a lot of women (myself included) are kind of stuck in this rut of layering on a few delicate gold necklaces or stacking rings and calling it a day. This new Chanel collection declared that statement jewelry is officially back, and despite Coco Chanel's famous advice to take something off before you leave the house, the more the merrier. We saw bedazzled Chanel chokers, mismatched earrings, necklaces dripping with flowers, layered cuffs and more. This season, let's all embrace loud jewelry, as according to Karl, it's way more fun. Last but certainly not least, we'd be lying if we said these two athleisure looks didn't take us by surprise. Bold hoodies layered underneath classic Chanel structured jackets and one full tracksuit gave off a refreshing accessibility that many Chanel collections in the past have never really had. Sweatpants? Zip-up sweatshirts? Under a tailored jacket? Yeah, I can do that. Which trend is more your speed? Personally I'm already shopping statement earrings.